APTOS — If horses could bet, odds are they would be behind the success of saddle-pad makers EquiPedic. The Aptos-based company, incorporated only a couple months ago, has introduced a saddle pad that allows a saddle to fit the contour of a horse more easily and regulates body temperature. Using phase cancellation techniques, developed in clothing to protect astronauts, combined with foam padding from mattress-maker Tempur-Pedic, the company is gambling that an upgrade in saddle pads has been long overdue. "People are still using the same philosophies and technology they used 150 years ago," said EquiPedic founder Richard Sacks. 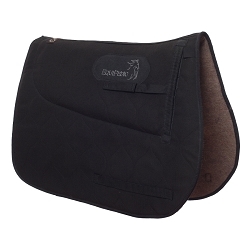 "This is the first saddle pad designed from the horse up. There is no other pad on the market that affects the body temperature of the horse in a positive way." The phase cancellation technology — popular in human environments from motorcycle helmets to body armor to sports gear — allows the horse to sweat easier when it needs to while holding in heat when the weather turns cold. EquiPedic claims its pad lowers the body surface temperature of the horse by as much as 7 degrees. "That is an incredible edge in terms of performance," said Sacks. While Sacks believes it can offer a competitive advantage for racing horses, he was surprised at how large the equine market is. "It’s a $23 billion industry," he said, larger than the film and tobacco industries. "But it is extremely fragmented." There are 7.2 million horse owners in the country, only 2 million of which own race horses or ranch horses. The remainder are recreation horses. EquiPedic has taken out patents on a saddle seat, cushion, girth and pad to tap into those markets. Marketing has been solely through its Web site, but the firm plans to unveil the pads at the Equine Affaire Trade Show in Pomona Jan. 30. Sacks saw a need to improve saddle fitting after testing 25 saddles for his daughter’s horse last spring. He ordered a custom saddle. Having worked for 30 years as a systems integrator in the computer industry, he recognized the problem as just that: how to integrate a pad that offered comfort, heat, better hygiene and solved saddle-fit issues. "Ninety percent of all tree saddles don’t fit in a static environment and nearly all don’t fit in a dynamic environment," he said. Since the actual pressure put on the horse is 1,500 pounds for a 200 pound person, a better fitting saddle can limit sore backs for a horse. Enter Tempur-Pedic, which like its mattresses, allows the saddle pads to naturally conform to the shape of the saddle and shape of the horse while allowing for breathing. 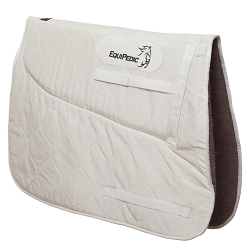 EquiPedic’s saddle pads retail for $189, less than generic ones but cheaper or comparable to other high quality ones. And the material can be washed, many others cannot. "You’ve got 5 million people spending a lot of money for a horse who then throw a $50 felt pad on which is not a comfortable fit," said Sacks. "It’s not that they don’t care. They just don’t know." Contact Michael Iacuessa at jcopeland@santa-cruz.com. 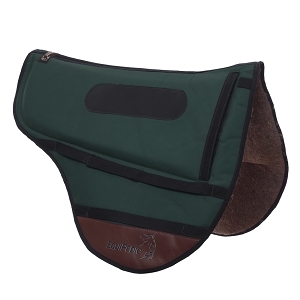 PRODUCTS: Has introduced a saddle pad that regulates the body temperature of a horse. In conjunction with mattress-makers Tempur-Pedic, it also offers a more comfortable fit for a horse while absorbing more shock for the rider.